we’ve ran workshops for Amanda Blooms Little Box of Crochet grand sale and met some amazing new friends, it’s all been good on the home front too! I’ve finished so many projects I’ve lost count! The pics are all on my Instagram account though, should I ever feel the need to look back! So 2019, there’s lots to look forward to, February we have our very own 1st Birthday weekend, and we are so excited! We have so many amazing things planned including a guest deigned workshop by Lottie & Albert, I’m slightly worried as I’ve turned into a bit of a fan girl 🙈 her YouTube podcast is brilliant to sit and watch whilst crocheting, you should give it a go! We’ve then got the March crochet day, which will be almost a duplicate of what we do on the February weekend, we do still have some March crochet day places left if anyone fancies booking Click here then, we have something mega exciting happening towards the end of February, something I never thought or even dreamt that would happen! But it’s all a big secret at the moment! Mr H turns 50 in April! And I’ve booked us a cruise for a week to celebrate, our first ever holiday since our honeymoon almost 19 years ago, scary, but exciting, then there’s the April Crochet Sanctuary oh the list goes on, how exciting!! I’ve had a good Christmas and new year break from work, albeit 2 funerals inbetween, but I’ve managed quite a bit of crochet time! I wasn’t keen on the colours together at first and had to keep checking the pattern, but I can see it’s starting to work! The yarn is gorgeous just lovely to use, but, I think I’ve gone a little wrong somewhere as the arms aren’t quite lining up with each other now, I wouldn’t mind but the pattern is very simple, so clearly I’ve not been concentrating! So we will see what they’re like! So, the next few weeks will be finalising designs for the February Crochet Sanctuary, I’ve also got a bit of pattern testing to do for another designer, I’m just waiting on my yarn to arrive, I’ve had a peak at the designs and they look AMAZING! But, hey ho, back to the grindstone tomorrow, back to work, needs must! Wishing you all a happy 2019 and thanks for taking the time to read throughout 2018! Our deadline for the spring CAL looms at the end of this week, so as per usual @lyndascraftoom and I have been hooking none stop!! It’s so worth it though because it looks stunning, and we’re rather proud! But I can’t show you! Not yet anyway. It’s amazing when we look back at Tea on the green, and then to this CAL just how far we’ve come, even if I do say so myself, we were ahead of schedule and then for slightly off track, only slightly, the CAL has now gone to Lynda for her unusual fabulous finish and then back to me for the border, but it means I can catch up and sort out designs for the next Crochet Sanctuary which is on 20th April until 22nd, so literally 8 weeks away. We’ve had so many messages about other dates, we were trying to wait until we’d sold out on the next date before releasing the rest but we’ve given up and released all dates now, so we have April, June, September and November. Just 4 rows a week, and the patterns are nice and easy to follow, I’m enjoying the process and I know it’s going to be a long CAL but I’m also rather excited to see the finished result too. I’ve also been teaching my 14 year old daughter to crochet! We spend a lot of time together and she comes to our Knitcraft social most weeks, and I kind of felt guilty that she couldn’t come on the last Sanctuary but she couldn’t crochet and of course it’s a lot of money to pay for her to be bored all weekend, so she has been nagging me if she can come to April, the deal was that if she can crochet she can come, so this happened! The chunky blossom is mine though!! And guess what? She completely unravelled her cake and decided she couldn’t do it 🙄🙄 do I’ll leave her for a bit and then give her a gentle reminder! So! While I’m here! We’ve sold out of all day passes for April, but we have got some rooms left for weekend bookings. It is going to be fab, each weekender will receive a fabulous Sophie’s stool!!! Amanda has a fab workshop planned and no doubt with some amazing yarn!! Taking of little box of crochet, I was very naughty and bought myself the Not so little box of crochet…..oh wow, just wow! Well!!! I couldn’t not could I?! So I’ll soon be getting started!!! Once the CAL has been sent and I can concentrate anyway! You can’t have too much right?! Our Knitcraft social group is growing rapidly!!!! I don’t know where they’ve all come from but it’s great!! We’ve had 4 new ladies join us, and @lyndascraftroom and I are thoroughly enjoying helping them to grow their yarn stash!! We’ve even had a little girl join us who is being taught how to crochet in school and even though she’s not quite joined the group she has been popping along with her Mum for help, and it’s lovely! I’ve finished the top part of Sophie’s stool!!! I still wish I’d dropped another hook size because it’s still slightly too big, pattern a 3mm for the top but I think I should of dropped to a 2mm, but it’ll have to do now, just the shoes to go, I’m so pleased with it. Today’s been great, we had our Knitcraft social this morning and then this afternoon we attended the Event City exhibition hall at Trafford for the craft show, we had won tickets through a competition ran by the lovely Lynne at Wool Nest, so free for us to get in, unfortunately not too much there in the way of yarn, I think 3 stalls in total, so we only stayed for an hour, I did treat myself to some king Cole cake (more yarn cakes) 🙈 I seem to have gained rather large collection of scheepjes whirls, Caron cakes, style crafts and now King Cole, there’s only so many shawls a girl can have! Then later this afternoon we popped into blacksheep wools for some more of their little patterns. What a book! The patterns are amazing! Really modern and I literally want to make everything. 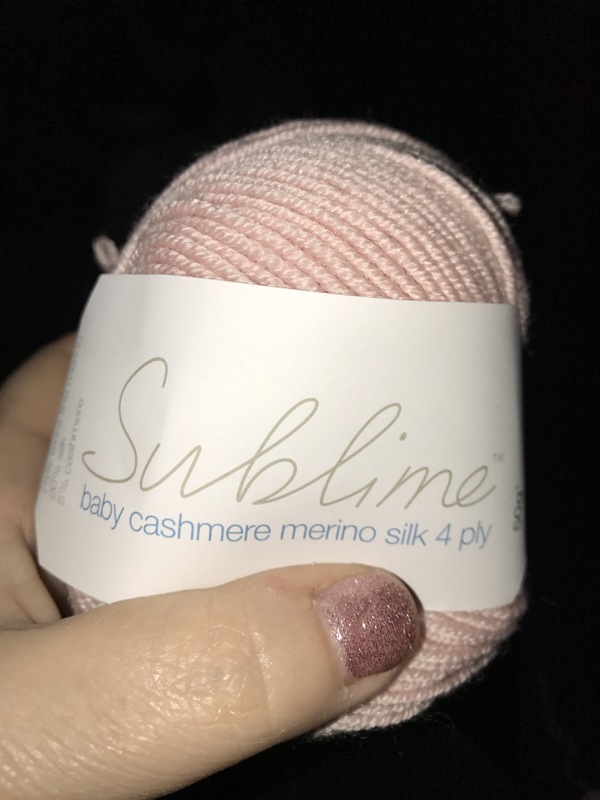 I think sirdar have described it perfectly, it is simply sublime, beautifully soft, and amazing to crochet with, it’s just a real treat and an absolute pleasure to use. 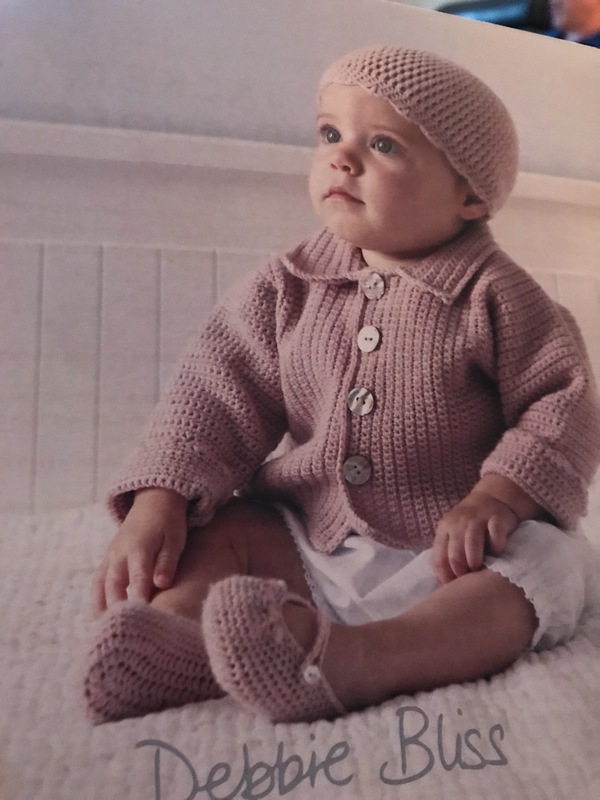 My only negative thing is that there are zero crochet patterns available for sublime, none. Each skein is 50g and 116m, which surprisingly goes a long way, I’ve so far managed to get 80% of a baby cardigan completed in sublime ‘piglet’ I’m currently just finishing the last little arm, then it’s the collar and edging, each skein is £5.29 I bought mine from Black sheep wools so for less than £11.00 I have a beautiful cashmere and merino silk cardigan to give as a gift, I’m so pleased with it. I’ve struggled with how the pattern is worded, I’ve had to read and reread some elements, put it down and come back again, but I’ve figured it and it’s stunning! I’ll have the last sleeve and collar finished by tomorrow so I’ll post a picture. Anyway, sirdar sublime, is sublime and a real treat to use!! Am I the only one who is a bit like a magpie when it comes to yarn and crochet patterns? Common sense would say to start one thing and bloody well finish it! But no not me! 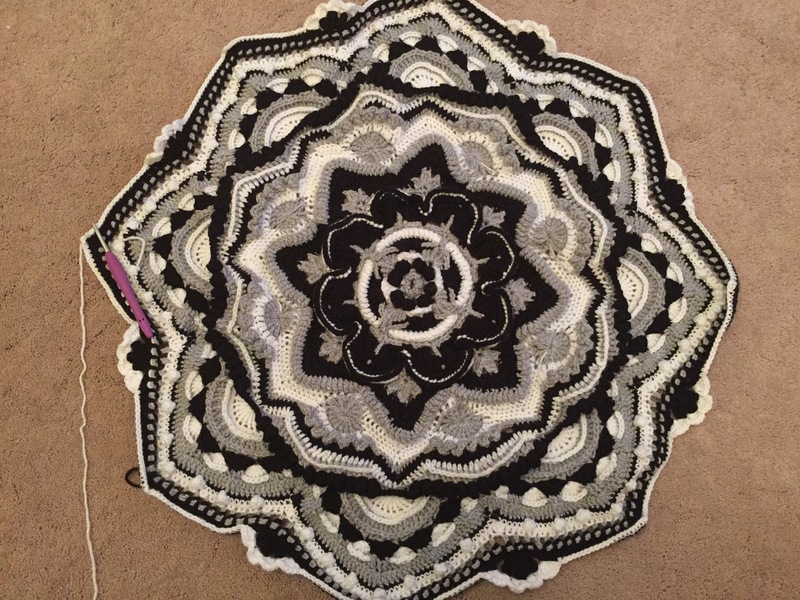 Magpie eyes has stopped me from doing a lot more on my carousel, but I’ve started round 4 today and I’m really enjoying it! I’ll get it done on time for Tuesday’s next release that’s for sure. Sometimes I avoid hobbycraft for buying yarn as they don’t do a lot of what I like, but a few months ago they took on a new knitting guru and she seems to have brought some life to hobbycraft for yarn!! Because they’re not starting to stock Janes c Brett noodle yarn (big thumbs up from me), Caron simply soft, which is fabulous s there are so many patterns out there for Caron and I often admire other people’s work when they’ve used that brand too. They’re also sticking sugar and spice!!! I love their cotton! I’m so pleased, and even better news, they’re doing them on the 3 for 2! It really gets my goat that Caron have given exclusivity for Caron cake yarn to Michaels in the US, really annoys me, because Michaels won’t ship to the uk, it makes absolute no business sense whatsoever, why limit your target market?! 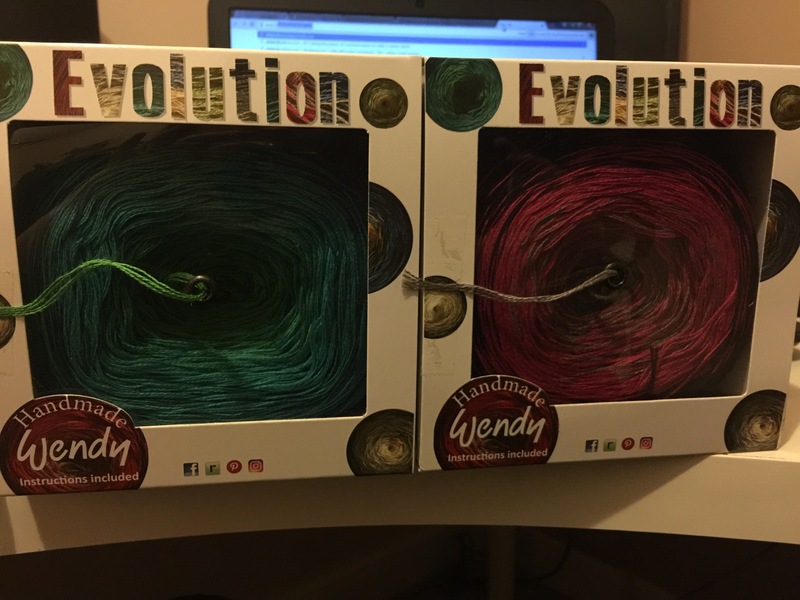 I’d love to get my hands on some Caron cake but my only option is Ebay at £30 a ball, so forget it, anyway, Blacksheep wools have actually started sticking s new yarn, very similar to Caron cakes, called Wendy evolution take a look at this!! How nice!!!! And work from the box! One is for my sister who wants a cowl, she’s chosen the green, and the pink and black is for my bestie, another cowl as a Christmas gift, gorgeous aren’t they?! Who needs Caron cakes anyway! !